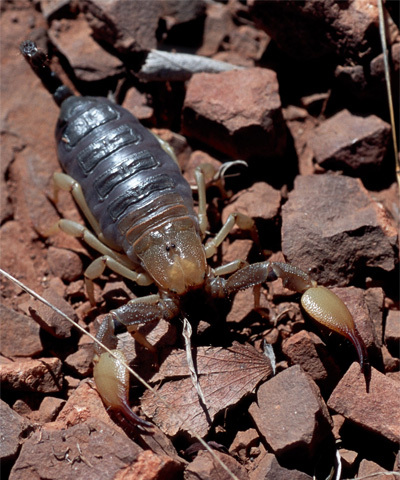 There are around fifty species of African burrowing scorpions. They are native to the southern and eastern parts of Africa with most residing in South Africa. They dig long, deep tunnels in fairly hard-packed ground. Species range in size from 2.5 inches to 6 inches. The African burrowing scorpion is a very attractive and colorful species with stocky builds and large, broad pincers. They spend most of their lives hidden underground. These scorpions are very aggressive. They will sting readily if cornered or restrained. Their venom ranges from mild to strong. If stung, the pain is very intense at the location of the sting and can last as long as 48 hours. This species is best left to the experienced collector. This scorpion will need a ten gallon terrarium tank with a heat pad on the bottom of one side. Three to five inches of Eco-earth, bed a beast, or potting soil make a suitable substrate. Bark or driftwood creates nice decor and hide areas for the habitat. A shallow water bowl and gut loaded crickets or cockroaches are need for the scorpion’s diet.